La Folia, the dance originating from the Iberian peninsula, was known already in the 15th century and an exact translation of its name would be „mad“ or „empty-headed“. The only thing we know about early folia is that it was a dance in three-four time with many variations. It was a very quickpaced men’s dance in which men were carrying other men dressed as women on their shoulders. 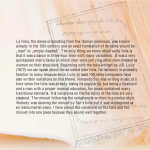 Beginning with the folia written by J.B. Lully (1672) we can speak about the so-called later folia. Its harmony is probably familiar to many because since Lully at least 150 other composers have also written variations on this theme. 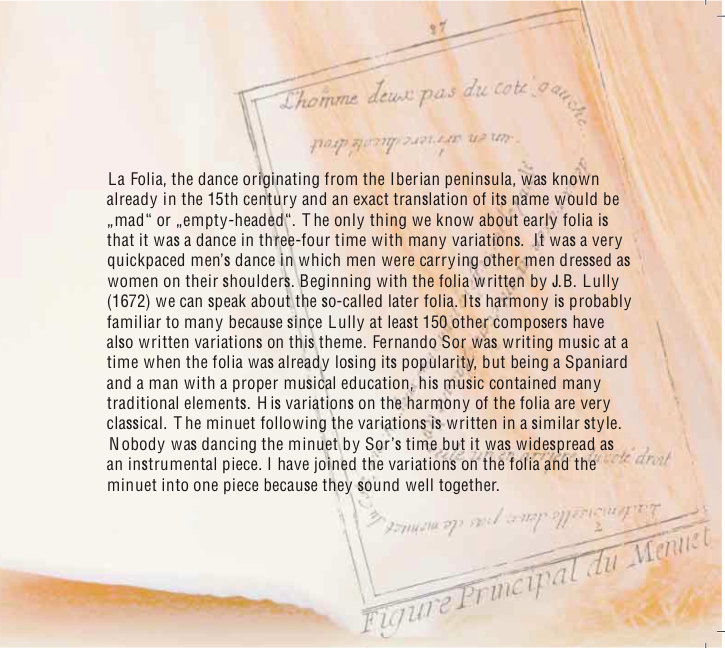 Fernando Sor was writing music at a time when the folia was already losing its popularity, but being a Spaniard and a man with a proper musical education, his music contained many traditional elements. His variations on the harmony of the folia are very classical. The minuet following the variations is written in a similar style. Nobody was dancing the minuet by Sor’s time but it was widespread as an instrumental piece. I have joined the variations on the folia and the minuet into one piece because they sound well together.